All our brand NEW featured products for Organic September plus our BOOM Awards Finalist Organic Coconut Oil plus…. 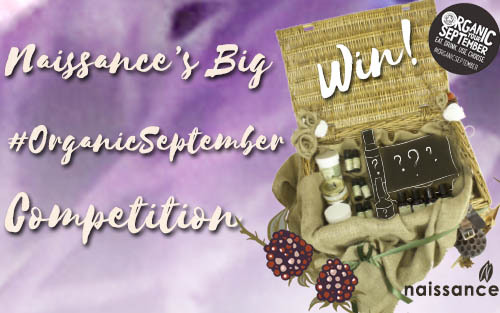 We also have 3 Runners up who will receive all of the NEW organic products we have launched #OrganicSeptember! There will be 3 categories and you can enter all three, but only once in each! Ok, so what are we looking for? Well, we are going to leave that up to you, but to give you some ideas, it could be based on any of the subjects listed below, or something else, providing it has an ‘organic’ theme. How do you picture an organic lifestyle? Thank you so much for sharing Sandra :D That body moisturiser sounds amazing! I found Naissance's.co.uk after yrs of looking for pure products!! I use your Shea butter with coconut oil whipped together with your frankincense-myrrh-lavender and black pepper oils,thry make a really beautiful body moisturiser also it helps with aches and pains!!! !